Tropical storm Harvey has lingered over SE Texas, pulling in moisture from the Gulf and pouring historic levels of rain over Houston and surrounding areas. President Trump will visit areas affected by the storm on Tuesday. 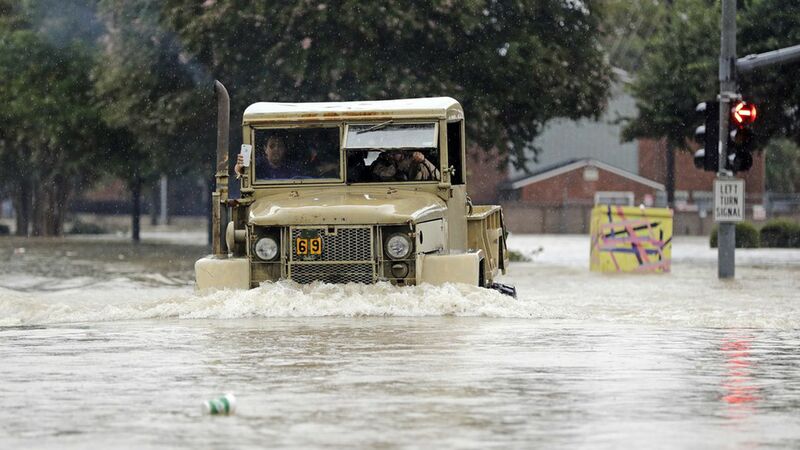 Authorities and volunteers have worked tirelessly to save stranded motorists and people trapped in their homes, with thousands of water rescues reported but many more people still seeking help. Five people have reportedly been killed in Houston and one in Rockport, but the full scale of the devastation may not be known for days. National Weather Service: "This event is unprecedented & all impacts are unknown & beyond anything experienced. Follow orders from officials to ensure safety." Gov. Greg Abbott: We "will continue to receive incredibly heavy rain that will lead to even more flooding and more danger." President Trump: "Wow - Now experts are calling Harvey a once in 500 year flood! We have an all out effort going, and going well!"